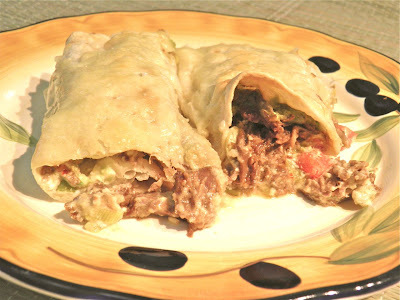 Tasty "inside out" beef & chillies enchiladas. I found some steak in the freezer today. Since I was trying to make room to put more stuff in “there” I figured it was time to thaw them out and deal with them. The stupidest thing about a freezer is the oldest items always gets pushed to the back. We’ve all found something in ours that is surprisingly old, haven’t we. I had sort of planned for enchiladas of some kind because I found very ripe avocados and on-sale tortillas at the grocery. What I didn’t plan on was making a recipe that is nearly inside-out. They’re not actually inside out, but they most of what goes outside on the inside. Self contained shall we say… Usual enchiladas have a spiced meat filling, mixed with some tomato sauce, baked in sauce and cheese on top. Chopped tomatoes, sour cream and avocado are served at the table. In this recipe they’re all inside. It worked very well. 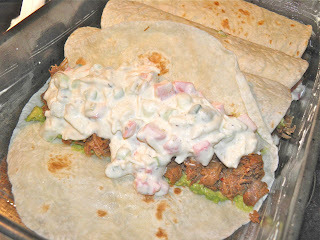 The idea came from another recipe I found when I was looking for recipes on how to cook with yogurt. The problem about cooking with yogurt is unless you stabilize it in some way it breaks in the oven into water and milk fat. Yuck. It seemed like too much a chore for this recipe. I avoided the issue by substituting sour cream. 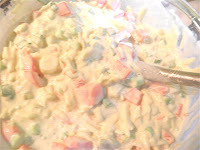 I also added a lot of the “outside” ingredients to inside with the sauce. These enchiladas aren’t particularly spicy in case you’re wondering. 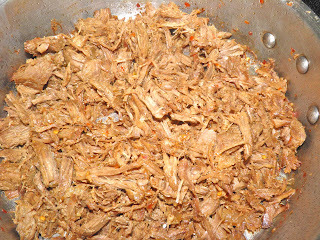 I think it was due to the chopped chillies which were on the mild side. If you substituted pickled jalapenos you would have a fiery beast. There is also only two chopped tomatoes in these enchiladas, so I guess they would fall into a category of "white" enchiladas, if there is such a thing. There is hardly any added fat, except for the cheese and dab of butter. If desired, you could use cooking spray for the pan so they don't stick and low fat Monterey Jack. I used low fat sour cream for the sauce. Serve side dishes with these and one enchilada is enough per person. So without further ado, here’s the recipe. Cut the beef into large pieces. Place in a deep sauté pan with a cover. Add the broth, chilli flakes, 2 tsp cumin seed and the juice of 1 lime. Bring to a boil, cover and simmer on low for 1-1/2 hours. Turn the beef periodically. Check occasionally to ensure it doesn’t go dry. If so add a little water. Step 3: the sauce. Then roll up, seam side down. After 1-1/2 hours the beef will be “fall apart” tender and the liquid will nearly be gone. 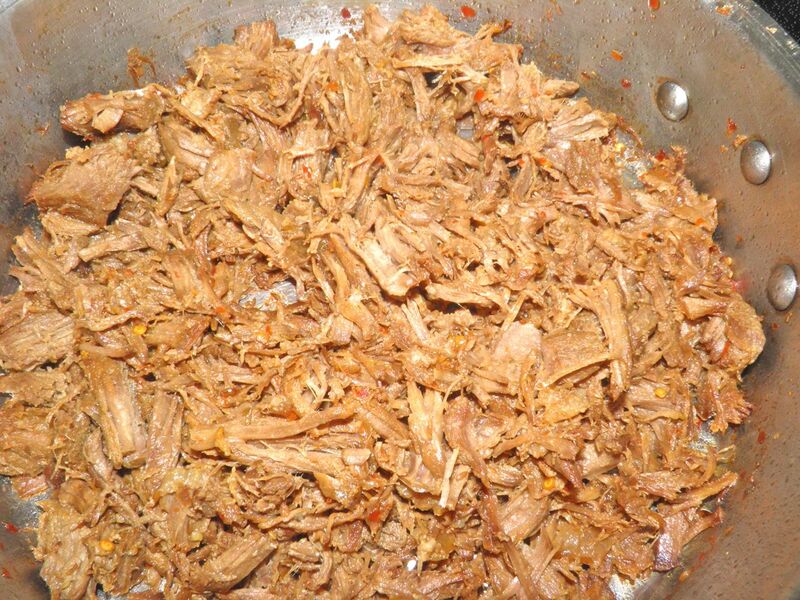 Shred the beef and return back to the pan. Let cool for 30 minutes. Stir in the juice of the remaining lime. 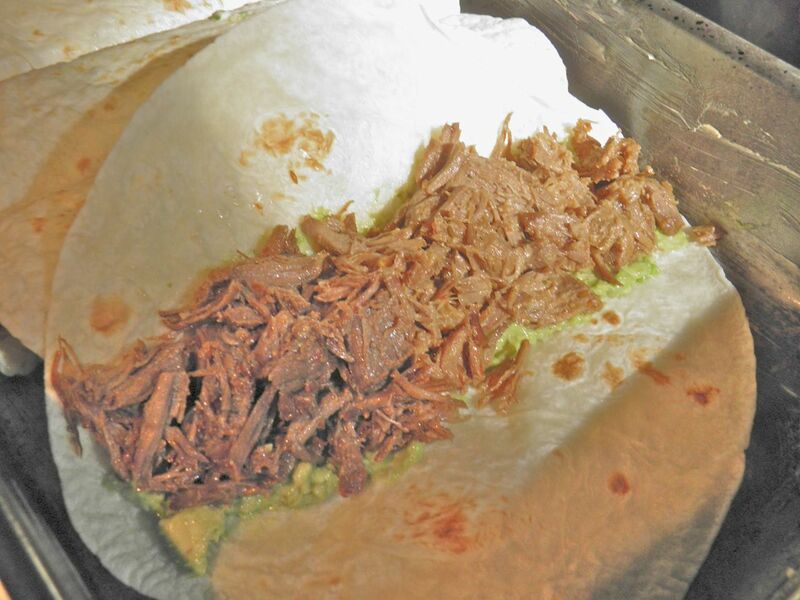 The meat will absorb the lime and any remaining liquid. Taste and add salt and pepper if desired. While the meat cools, preheat the oven to 375°F. Combine the sour cream, 2 cup of the cheese, green chillies, 1 tsp cumin seed, chopped tomatoes and green onions. Add 1/2 tsp of salt and some black pepper. Peel and mash the avocados. 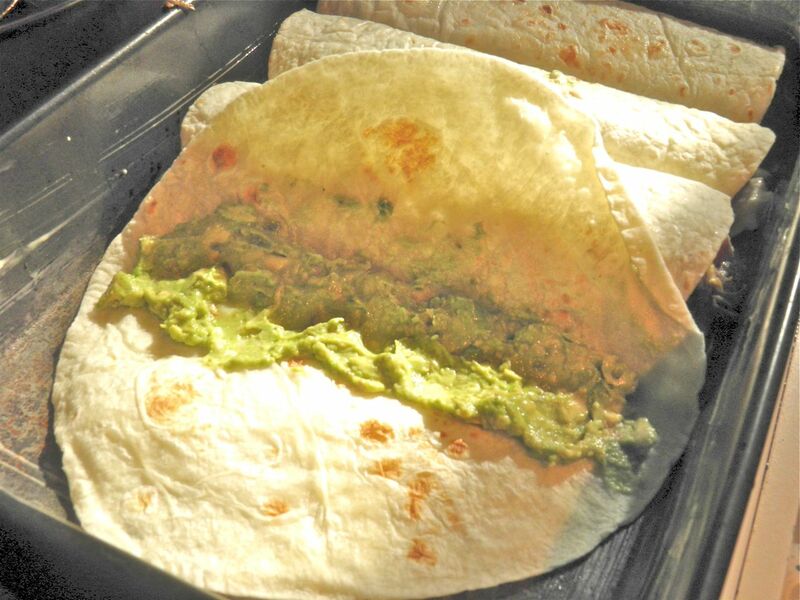 Spread 1/6 of the avocado on each tortilla. 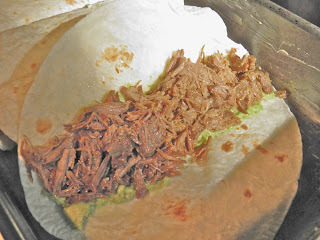 Then place 1/6 of the shredded beef down the centre, followed by 1/2 cup of the sour cream mixture. Roll up and place seam-side down in a buttered casserole dish. Sprinkle the top of the enchiladas with the remaining 1 cup of cheese. Bake for 30 minutes or until the cheese is browned and bubbly on top. Serve each enchilada with side dishes if you wish, like Spanish rice, refried beans and/or corn bread. If you like this post retweet it using the link at top right, or share using any of the links below. Health: The Good, The Bad and The…Green? Recipe: Culturing kéfir from kéfir grains! © 2011-13 Docaitta original material only. For duplication permission please contact. Simple theme. Powered by Blogger.